Our vibe series room dividers are now in stock! These modern, sliding glass dividers are great for any space. Small lofts or apartments benefit as they do not require the same amount of space as a traditional swing door. They are also great for larger rooms to add more function to the space - perhaps you want to divide up a large living room for a separate office, or dining space. They are also great for basements to add an extra bedroom for an additional family member or guest. Great to separate a kitchen space from a living space - this allows the open conecpt feel when required, but also allows you to divide the kitchen when required. The possibilities are endless! The vibe room dividers offer a minimal and modern frame with a variety of optional inserts. With soft close hardware that is simple to install, these room dividers are a great addition to many modern, contemporary and eclectic styles of homes. They can be installed in either a ceiling or wall mount application, however the wall mount application does require a bit of advance planning as the doors require a backing to ensure proper support. Canadian made aluminium frames allow our series of room dividers to require effortless installation and the panels can be easily moved and adjusted. 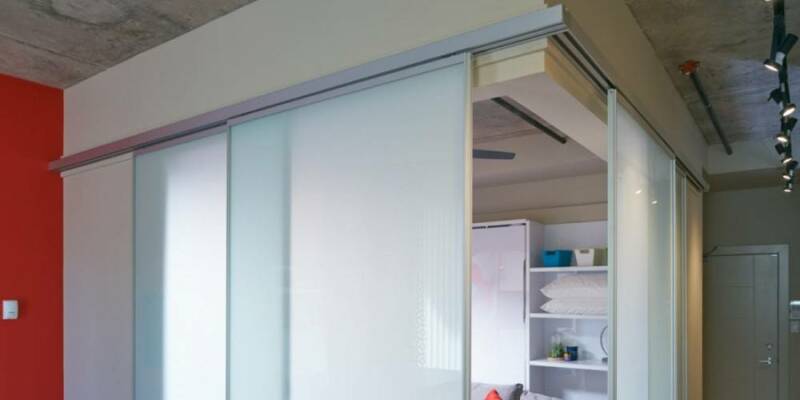 The vibe series room dividers offer many options - single or double panel and can also be installed in a corner entry style which is great for small apartments or lofts where there is no official bedroom. Aptly named, this series creates an incredible "loft vibe" in any space. The insert possibilities are endless, and we currently stock clear and diffused glass, white back painted glass, as well as clear mirror at our Edmonton location. We can supply and install the complete product, or if you are a "do-it-yourselfer" we can provide supply only pick up options as well. We also supply hardware to businesses across Canada! Ready to divide and conquer? Get in Touch!